Nancy López is professor of sociology at the University of New Mexico (B.A. Columbia College, Columbia University, 1991; Ph.D. Graduate School & University Center, City University of New York GSUC-CUNY, 1999). Dr. López directs and co-founded the Institute for the Study of "Race" and Social Justice, University of New Mexico (race.unm.edu) and she is the founding coordinator of the New Mexico Statewide Race, Gender, Class Data Policy Consortium. Dr. López has served as the inaugural co-chair of the UNM Diversity Council and she is Secretary-Elect, American Sociological Association and Vice President, Sociologists for Women in Society. López's scholarship, teaching and service is guided by the insights of intersectionality --the importance of examining race, gender, class, ethnicity together--for interrogating inequalities across a variety of social outcomes, including education, health, employment, housing, and developing contextualized solutions that advance social justice. Her book, Hopeful Girls, Troubled Boys: Race and Gender Disparity in Urban Education (Routledge, 2003) focuses on the race-gender experiences of Dominicans, West Indians, and Haitians to explain why girls are succeeding at higher rates than boys. Dr. López co-edited, Mapping "Race": Critical Approaches to Health Disparities Research (Rutgers, 2013), a multidisciplinary volume that was the byproduct of National Institutes of Health (NIH)-funded workshop. The book departs from the premise that “race” is a multidimensional and multilevel social construction that has profound methodological implications for research and policy. Her current work includes a national representative survey of Latinos to examines the health outcomes of Latino immigrants by examining a new measure of racialization she calls "street race" and "street race-gender." Another project involves a content analysis of official documents of the Office of Management and Budget (OMB) and the Census as sites of racial formation; she cautions that current proposals to combine two analytically distinct concepts, Hispanic origin and race, into one question and plans to couple national origin and race in question formats may undermine civil rights monitoring and enforcement. Dr. López argues data collection should be anchored in "ethical accuracy" for social justice rather than "aesthetic accuracy" or a superficial, cosmetic, decontextualized accuracy for compliance only. Dr. López is completing demographic profiles of New Mexico that examines the historic and contemporary complex inequalities trends in race-gender-class gaps in income, employment and wealth as well as the impact of school-level resources on college graduation at a large public university in the Southwest. Dr. López is collaborating with interdisciplinary scholars at the University of New Mexico and school administrators on examining the impact of Community Based Participatory Research (CBPR) and the implementation of liberatory curriculum and pedagogy that is anchored intersectional praxis (action and reflection) in a large public school district in New Mexico through the Ethnic Studies Education and Health (ESEH) Research Practice Partnership (RPP) for Empowerment and Equity in P-20 schools and universities. Dr. López has taught for over two decades in a variety of public universities (City University of New York, University of Massachusetts-Boston and the University of New Mexico), that serve a very diverse group of students, including those who like Dr. López, were the first in their families to complete high school and pursue higher education. Dr. López has chaired or served as a member of over 30 doctoral degree committees and 20 masters degree committees. Dr. López has received several awards recognizing her contributions to mentoring, teaching, research and community engagement, including the William Foote Whyte Distinguished Career Award for Sociological Practice and Public Sociology, American Sociological Association; the Feminist Research Institute Distinguished Lecture Award; Gunter Starkey Teaching Award, Presidential Luminaria Award and the Inaugural Academic Leadership Academy Fellowship of the Division of Equity and Inclusion, UNM and the Fredrick Douglass Award, New Mexico Black History Committee. 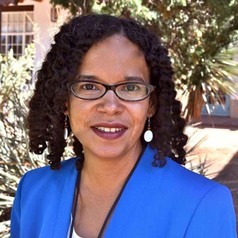 Dr. López is the first woman of color tenured in the Sociology department and the first woman the African Diaspora (AfroLatina) tenured in the College of Arts and Sciences at the University of New Mexico.